Recorded 21 February 1939 on matrices 1044 1/2 and 1045-2. First issued on Grammophon 15243. Recorded 20 May 1930 on matrix CVE-59797. First issued on Victor 7322. Recorded 22 December 1941 on matrices CS-070163/6. First issued on Victor 11-8541/2 in album M-958. Recorded 27 November 1941 on matrices CS-071252/3. First issued on Victor 18498. Recorded 6 April 1942 on matrices XCO 32650/2. First issued on Columbia 11993/4-D in album X-244. Recorded 27 March 1940 on matrix CS-047825. First issued on Victor 18166. Recorded 4 February 1946 on matrix XCO 35795. First issued on Columbia 12623-D in album MM-695. Recorded 31 October 1945 on matrix D5-RC-1249. First issued on Victor 11-9157 in album M-1050. Recorded 14 June 1943 on matrices 2-70908/9. First issued on Cetra BB 25116. From the NBC broadcast of 14 October 1939. Recorded 19 October 1936 on matrices 021469/71. First issued on Telefunken E 2079/80. Recorded 2-7 July 1946 on matrices A 6209 and A 6214. First issued on Polydor 566211 and 566215. Recorded in 1929 on matrices 800 Bi and 799 Bi. First issued on Grammophon 95295. Recorded 15 September 1930 on matrices 30458/60 and 30462. First issued on Ultraphon E 463/4. on Columbia 11575-D in album X-200. Recorded 18 February 1932 on matrices 2B 2196/7. First issued on HMV DB 1662. Recorded October, 1946 on matrix CAX 9720. First issued on Columbia DX 1479. Recorded 28 April and 30 August 1926 on matrices CR 346/7. First issued on Disque Gramophone W 749. Recorded 2 May 1935 on matrices TA 1781/2. First issued on Decca K.768. In the year 2000 we were besieged with Bach from every angle usually with pretensions toward 'authenticity'. Certainly the was certainly the occasional CD of orchestral arrangements. I recall the Slatkin disc on Chandos. The present disc is for the open-minded Bach-ophile. As you can see from the dates of the recordings, the present set makes conveniently (and generously) available recordings garnered from far and wide. These are from an era (rather a long one at that) when arrangements, tinkering and 'improving' were politically correct. Authenticity is (or has been) the new orthodoxy since the 1970s. Big band Bach is seen as disrespectful - even corrupt - artistically speaking. There has of late been a degree of relaxation. Stokowski's realisations have managed, for years, to secure a place in the catalogues for such arrangements even in the chilliest winter of authenticity. What this set goes to show is that, as some specialists will have known for many years, the making of Bach arrangements for orchestra has been a sport practised far more widely than the general interest listener might have realised. Let us take the arrangements in the order they appear on the discs. Melichar's BWV 565 makes darkly premonitory storm clouds out of this clipped and splenetic Toccata and Fugue. The disc exhumes an amazing level of orchestral detail. Damrosch's deliberate Gavotte from BWV 1012 is not at all over-romanticised. It is interesting too to note the nicely judged dynamic contrasts of the original. Frederick Stock's bloomingly generous St Anne at Chicago is rendered in good 1940s vintage sound making a bitter contrast with the primitive sound of the Damrosch Gavotte. The Stokowski Arioso is here but not with the Philadelphians - instead with Toscanini's NBCSO. This is a grave and far from flashy piece of work. Mitropoulos and the Minneapolis Symphony in 1942 did much to impress in BWV 542 but for me this does not gel. The whole thing is too portentous by half. Until this point the tracks have been conducted by the arrangers. Ormandy conducts Charles O'Connell's Herzliebster Jesu in a grave and rather broad account. I noted a slight and subtle 'popping' noise at 1.00. This is one of the few 'defects'. The Little Fugue is cheekily arranged by Cailliet. This finds martinet Reiner in trimly witty mood with the Pittsburgh. This is mightily impressive. Still more commanding is Pick-Mangiagalli's BWV 1006 Preludio. Koussevitsky sends liquid fire dripping from the wings of this piece aided by the Bostonian's - playing as if possessed. After all these American orchestras we now skip to Vittorio Gui's two Chorale Preludes - grave in case of BWV 622 but with spark and liveliness in BWV615. Respighi's C minor Passacaglia and Fugue comes from an NBC broadcast in which Toscanini tends towards a stern and rather pitiless perfection. The second disc launches with Hans Schmidt-Isserstedt, in 1936, conducting the Berlin PO in his own arrangement of the Italian Concerto in F major. The andante is wondrously gentle and reflective. There is a heartless scampering rush about the Presto relieved by some Mozartian premonitions. Kemperer's 1946 Paris Pro Musica recordings of BWV 599 and Bist du bei mir are very grave by comparison and the sound quality is fallible for its vintage though the richness of the bass on track 5 is very satisfying indeed. These tracks have had their pitch computer-stabilised by Dr Dimitrios Antsos. Some hope then for a pitch and wow corrected recording of Rubbra conducting the premiere of his Fourth Symphony. Schoenberg arranged the music of quite a few composers including Strauss and Bach. His Schmucke dich proceeds at a glutinous snail's pace in Horenstein's hands as does the stop-start Komm, Gott. Romantic touches such as the harp silver-points in the closing bars are notable. Erich Kleiber infuses more drive and charm into the same Berlin Phil for Schoenberg's 'take' on the St Anne. Barbirolli wastes no time over Sheep may safely graze. It positively flies. The NYPSO ski along smoothly with no impression of friction. There is a great Tchaikovskian flourish at 1.40. This is all extremely well rounded. Coates' LSO use a version of the Toccata in F Major arranged by Heinrich Esser with an alternative concert ending by Elgar thudding its way forward from 6.20 onwards. Those off-beat stamps are a clear carry-over from the Elgar Second Symphony. Sargent's own romantically tasteful arrangement of the famous Air from BWV1068 proceeds with a steady pulse. Elgar manages a suggestion of guttering flames and a phantasmal siege around castle walls in his skilled steer through his own arrangement of the C minor Fantasia and Fugue. There is even a hint of Nino Rota about it. The brass call out with golden and abrasive effect and the percussive 'lightning strike' at 5.19 is wonderfully done. This is an indulgently out of control tumbril of a performance. Glorious! Henry Wood originally perpetrated his Bach arrangement of the D Minor Prelude and Fugue under the name of 'Paul Klenovsky'. Some years later he came clean. He seems to have used a pseudonym because his earlier arrangements were slated for their Wagnerian overtones. This arrangement has a bright tinkling character, Russian à la Rimsky and lit with a broad colour spectrum. This makes it and the preceding Elgar the standout winners in this rather special collection. Wood puts his orchestra through a fantastic roller-coaster of a ride. Amongst the sled-loads of Bach CDs this year (250th anniversary) this anthology of twentieth century approaches to Bach is varied, surprising, satisfying and, thank heavens, suffused in the case of many tracks, with a non-PC approach. Prissy reverence can have a stultifying effect which thankfully is largely absent from these discs. First class programme notes of substance from Edward Johnson. I do not know the originals so it is difficult to comment definitively on the transfers. All I can say is that they are managed smoothly but with sufficient grit and distress to suggest the originals. It would be disconcerting if all the tracks had been so homogeneously processed that they sounded similar. There is not trace of that. Instead the age and acoustic range of the discs is suggested by a variety of sound and effect. I think we can take it for granted, when we see the name Mark Obert-Thorn, that the transfers will have been handled with taste and a dedication to extract the most data possible from the original grooves. Better yet the two disc set is available at mid-price. Unfashionable music - or, to be more exact, music played in an unfashionable manner - is the raison d'être of a new double CD from Biddulph. It is a single composer release, with J.S. Bach played in a way that will make the purist shudder and look for the off switch on the remote control. We are talking about Symphonic Bach - his music arranged for full symphony orchestra and sounding a world removed from today's lean, 'authentic' style. The recordings date from 1926 up to the mid-forties, with eminent conductors and orchestras. 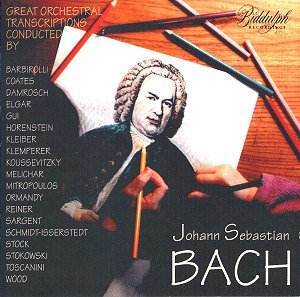 In that period, and earlier, it seemed that few conductors could resist making their own personal arrangements of Bach's music and this release showcases a selection of 78s of the period. One wonders how many of these orchestrations were simple self-indulgence or how many of the arrangers were trying to match Stokowski's success. His still famous recording of the D Minor Toccata and Fugue with the Philadelphia Orchestra of 1927 no doubt prompted much envy and peer pressure among his fellows. This allied to some nudges from record companies looking for comparable financial returns prompted many recordings in the same style. The tracks are not in chronological order but taking them in the listed sequence finds Grammophon's then 'House' conductor attempting to emulate Stokowski with a slightly ponderous D Minor Toccata & Fugue. Walter Damrosch conducts a charming arrangement by his father of the Gavotte for Solo Cello and in its first appearance (the Schoenberg version is on CD2) the "St. Anne's" Prelude and Fugue is given a richly romantic performance by Frederick Stock with a recording which is remarkably good for its time. Stokowski himself conducts his own arrangement of the Arioso of Cantata 156 - inevitably lush and unhurried, with harps prominent, a strong contrast to Mitropoulos' version of the G Minor Fantasia and Fugue - dramatic and angst-ridden with prominent brass in the Fantasia and a noticeable character change for the Fugue. Orchestrations other than by the conductors form a trio of tracks - a romantic extract from the St. Matthew by Ormandy, Reiner in a busy, richly scored "Little" Fugue, an inviting strings-only Preludio from Partita No 3 (Koussevitzsky) and two fairly routine orchestrations of his own are conducted by Vittorio Gui. The Toscanini track is from a 1939 broadcast (with applause) using the Respighi version of the C Minor Passacaglia and Fugue. Richly scored, played here with energy and fire it was in the conductor's repertoire for a number of years. Hans Schmidt-Isserstedt conducts his own arrangement of the Italian Concerto. With strings and some delightful writing for the woodwinds the piece is a charmer from start to finish. The sleeve notes apologise both for the technical quality of the playing and the recording quality of the two Klemperer pieces from Paris in 1946 but as they are the only Bach-Klemperer transcriptions extant they undoubtedly have historical interest. Schoenberg's name appears as the orchestrator of the next three tracks - two brief Chorale Preludes (Horenstein) and a diverse and colourful version of the "St. Anne" Prelude and Fugue (Kleiber). The Kleiber track suffered from pitch variations that Biddulph have worked hard to overcome and as his only recording in the genre must be looked on as an historical document. The remaining items have a strong British interest with arrangements by Barbirolli (warm and attractive despite being from his ill-fated New York period), and an intriguing orchestration of the F Major Toccata shared by Heinrich Esser (originally from 1859) and Elgar - whose ending, added in 1908, is used in this curiosity. Malcolm Sargent's version of the Air from Suite no 3 - has some appeal but the rubato makes it sound doubly old-fashioned. More Elgar in his arrangement of the C Minor Fantasia and Fugue - a magnificently full-blooded orchestration that still refuses to sound dated even in a 1926 recording. The Henry Wood D Minor Toccata and Fugue was scored for a large orchestra with an extra large percussion section along with quadruple woodwind and brass. The technology of 1935 failed to capture all of the attempted fireworks but enough of this attempt to out-do Stokowski remains to impress. Potential buyers need have no undue concerns about the sound quality. Obviously there is surface noise and the recordings are period pieces but one must commend all involved in the re-processing which has been so successful.